My good friend, Nicki, was going to a birthday brunch for her friend, Sam. Sam’s boyfriend was planning to surprise her by proposing at the brunch! The plan was to top some cupcakes with fake diamond rings – all except Sam’s which would be topped with her real engagement ring. Nicki asked me if I could make the cupcakes and I was happy to! 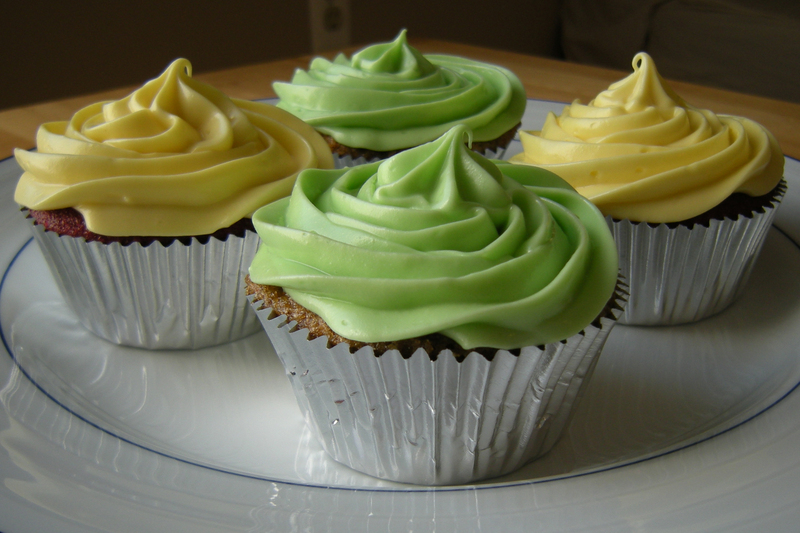 Half of the cupcakes were carrot cake with cream cheese icing, tinted green. The carrot cake recipe I used is one that I had used before for Nicki’s Christmas cake. I halved the recipe this time and ended up with 12 cupcakes. For the rest of the cupcakes, they requested red velvet cake. I had not ever made red velvet cake from scratch before so I needed to find a good recipe. I posted a request for a recipe on The Nest and my fellow Nestie, Mary, highly recommended this recipe. I only needed about 6 cupcakes, so I made only a third of the recipe (and I got 10 cupcakes). I was very pleased with this recipe – the red velvet cake was delicious! You are currently browsing the Decorate This blog archives for April, 2010.